The “B” color gene is pretty straightforward and easy to understand, especially compared to the “C” gene, or even the “A” or “E” color genes. That’s because it comes in only two varieties: the dominant “B” and the recessive “b.” “Easy” is relative, when it comes to genetics! But let’s just dive right in. Any rabbit you see either belongs to the black family of colors or the brown (chocolate) family of colors–regardless of the main color that you see when you look at the rabbit. The vast majority of Holland Lops, or really of most breeds, you will see at a show or at the typical barn belongs to the black family. Black family colors include black (I bet you weren’t surprised by that one! ), blue, black tortoiseshell (tort), blue tortoiseshell, sable point, smoke pearl, and chinchilla. Chocolate family rabbits include chocolate, lilac, and lynx, among others. The rabbit on the left is a chocolate with the genotype of "bb". The rabbit on the right is a black with the genotype of "B_"
Black family rabbits are either “BB” or “Bb.” Unless you see a chocolate color in a rabbit’s pedigree, it’s fairly safe to assume it is “BB.” Chocolate family rabbits are always “bb.” And chocolate family rabbits cannot carry the black gene “B.” That’s it. All Holland Lops, Mini Rex, Dwarfs and all other breeds are either “BB,” “Bb”, or “bb. When you breed a true-breeding black family rabbit, that is, a black with two dominant “B” genes, to another true-breeding black family rabbit, you will always get a true-breeding black family rabbit. Another way to say that is that “BB” x “BB” always yields a “BB.” Each parent has only the dominant “B” to give its offspring. Things get a little more interesting when you breed a true-breeding black family rabbit with a chocolate family rabbit, such as when breeding a black tortoiseshell to a lilac. One hundred percent of the offspring will be black family rabbits that carry the chocolate gene. Look at the chart below to see just how that happens. Now let’s look at the result from breeding back one of these “Bb” offspring to another chocolate family rabbit (bb). When you are breeding chocolates with your black tortoiseshells to improve type, you will readily see that it is a two-generation process. In this second generation (breeding the offspring back to the chocolate parent, for example), two out of four offspring, on the average, will be chocolate, and the remaining two will carry chocolate. Let’s see how this works. 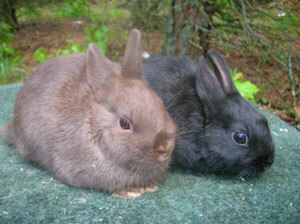 Another option when breeding for chocolates is to breed two chocolate-carrying black color family rabbits together. The yield is not as high as with a chocolate to a chocolate-carrying black family rabbit, but sometimes you may want to breed two rabbits together for their complementary types. If you do, then one out of four offspring, on the average, will be chocolate. Another two will be black family rabbits that carry chocolate. The remaining one out of four will be a black family rabbit that does not carry chocolate. This a broken chocolate doe. Except the broken gene, the genetics on a broken and a solid rabbit of the same color are the same. You will not be able to tell just by looking which of the black family rabbits carry chocolate and which do not. But you can test breed each rabbit with a chocolate to find out. If the rabbits produce even one chocolate bunny, you know that the rabbit you are testing carries chocolate. If the rabbit produces a number of offspring and never produces a chocolate, you can assume that it does not carry the chocolate gene (unlike the reverse situation, no chocolates is not proof, but with a large enough number of non-chocolate offspring, the odds are greatly in your favor of making an accurate evaluation). The last combination of rabbits would be a true-breeding black color family rabbit with a black color family rabbit that carries chocolate. You will not produce any chocolates in the first generation; half would be true-breeding black color family rabbits and half would be black color family rabbits that carry the chocolate gene. But you could go on in the second generation to get approximately 25% chocolates when you match up the “Bb” chocolate carriers (it may take a little trial and error to figure out who carries the chocolate and who does not). This option will not produce as many chocolates as soon as breeding two chocolates, certainly, but if you are working on type with a particular line, this information could come in handy. The examples above show how to get the “bb” genes into a rabbit line in general. But sometimes you may want to breed for a specific color within the chocolate lines. If so, the following chart may help. On the left, you will find the colors of the black color family. To the right of each color is the corresponding color in the chocolate family. That is, the two colors on each line vary only by the Black-Chocolate (B-b) gene. If you want to breed for chocolates, for example, you could use a chocolate-carrying black with a chocolate for a fairly high percentage of resulting chocolates (even two chocolate-carrying blacks could work). A lilac tortoiseshell might be a very handy rabbit to have when attempting to produce a specific full color chocolate family rabbit (full color means has a dominant color or “C” gene). Since the genotype is aa bb C- dd ee, it would allow any recessive genes of the other parent to be expressed. The black-chocolate color genes are very straightforward. There are only three combinations (“BB,” “Bb,” and “bb”). Understanding what the chances are for producing chocolates when breeding different rabbits can help in your breeding plan, especially if you are breeding again to black tortoiseshells to improve type. There is a corresponding color in the chocolate family for each color in the black color family.